We specialize in contact lenses. Regardless of your prescription we will strive to meet all of your eye and vision care needs. After a comprehensive eye and vision evaluation, Your doctor will discuss the variety of contact lens options with you to select the type that best fits your vision needs and lifestyle. Prior to prescribing contact lenses, your doctor determines what level of vision correction you require. Refractive error (commonly known as nearsightedness, farsightedness, astigmatism, or presbyopia) is evaluated. External eye health is evaluated to determine if the eye is phsically capable of supporting a contact lens. After determining the level of refractive error, your doctor works with you to determine whether contact lenses or glasses are best for your lifestyle. If you suffer from certain conditions, such as dry eye or allergies, glasses may be the most comfortable corrective solution. 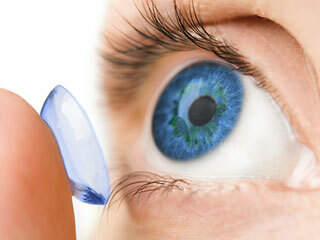 Contact lenses are available in soft, rigid gas permeable, hybrid, or corneal molding forms. They may need to be changed daily, weekly, bi-weekly, or monthly, depending on what type of lens you select. Specialized contact lenses, such as bifocal contact lenses, post surgical lenses, and corneal irregularity lenses are available.